Protecting your favourite leather pieces is truly worthwhile. Now that you have your new leather item, it’s important to know how to care for it so it will stay looking beautiful. All products made from natural leather will need moisturising and care from time to time. Leather will age over time and develop its own patina. This is a natural process and will give each leather item its own character. To help you care for your item, all of our products come with a complimentary pot of Renapur leather balm (subject to the suitability of the leather) and a cotton dust bag. Every item purchased from The Leather Store will come with its own cotton dustbag. Keeping your bag in the dustbag when not in regular use will keep it clean and dry and stop excessive dust from collecting. If you are storing your bag for any length of time, gently stuff your bag with tissue paper or old clothes to help retain its shape. If your bag or purse gets wet, it’s important that you let it dry naturally and do not place the item in direct sunlight or heat such as a fire or radiator. Excessive heat will damage the leather fibres. Once the bag is dry, use your leather balsam to renourish and condition the leather. Your purchase will arrive with a complimentary pot of Renapur Leather Balsam and care instructions. It’s important that you clean and condition the leather regularly. This will replenish lost moisture, keep the leather fibres flexible and protect your item from the elements. Scratches and scuffs are a normal occurrence in leather but they can be removed and treated. Small scratches can be removed by firmly rubbing the area with your finger which will agitate the natural oils to the surface. For larger or more stubborn scratches, apply a small amount of your leather balsam to the area with a dry, clean cloth and buff. You can also use a regular shoe polish in a matching tone to restore lost colour. Always spot test on a discreet area before you apply any product on the leather. Always carry liquids separately as any spillages will damage your bag. Never use water or chemicals to clean your leather item. Any stains should be removed by a specialist. Regularly clear out your bag of old receipts and unwanted items. This will keep your bag clean and tidy and allow it to rest and recover. 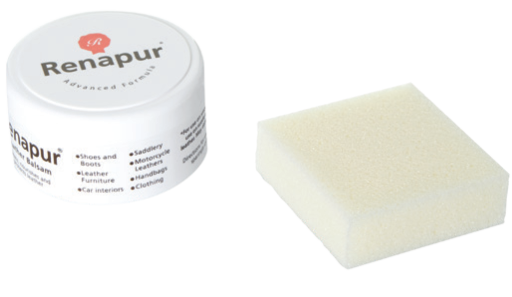 The Leather Store uses only the highest quality leathers and we’re delighted to team up with Renapur who are a leading leather care provider recognised the world over. Their signature Leather Balsam is made from natural waxes and oils. It’s fragrance free, non-greasy and easily absorbed into the leather and completely safe to humans and animals. It’s the perfect way to keep your natural leather goods as beautiful as the day you received them.